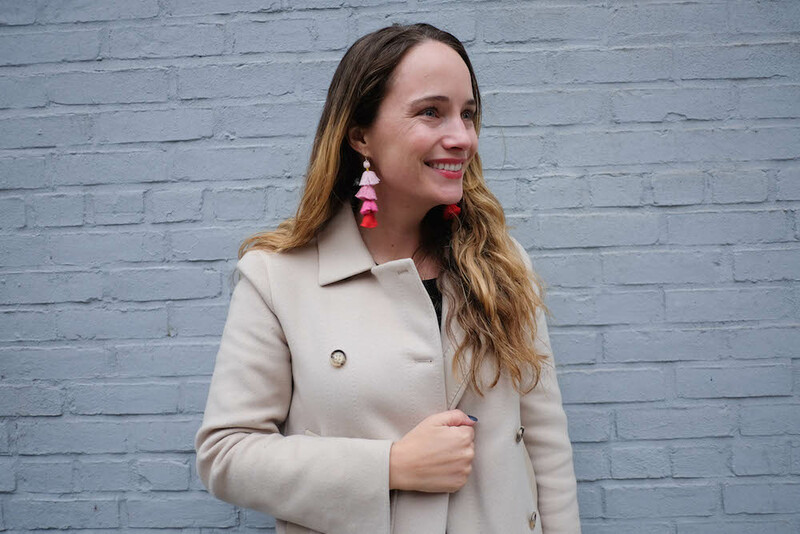 A while back, my friend Jenn wore the most fabulous multi-color tassel earrings on her blog. 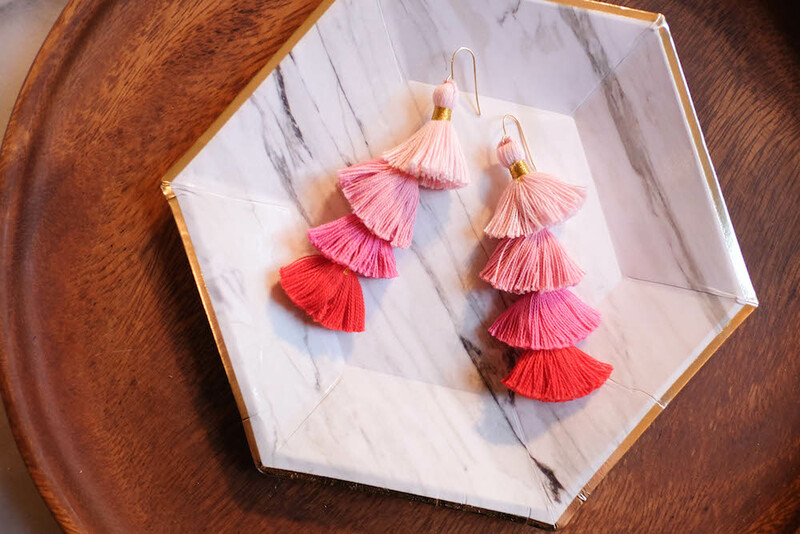 I immediately clicked over, thinking about buying a pair… but then when I got a better glance at them, I realized how easy they would be to make on my own… those big statement earrings are really just four small tassels layered over each other. And so, this tutorial was born! It is so easy. I whipped up the above three pairs in under an hour. I chose to sew the tassels together (well, more like stringing them on thread) but you could probably use glue as well. My rule is to sew when I can… the results hold up better in the end. They’d make such a cute Valentine’s Day gift for your girlfriends! 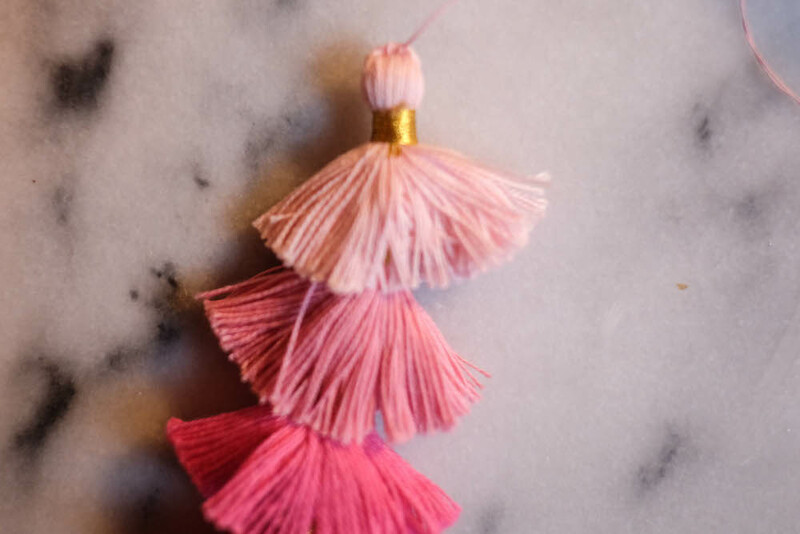 Set of mini tassels (I used this pink + red set, this purple set, and this neutral set). 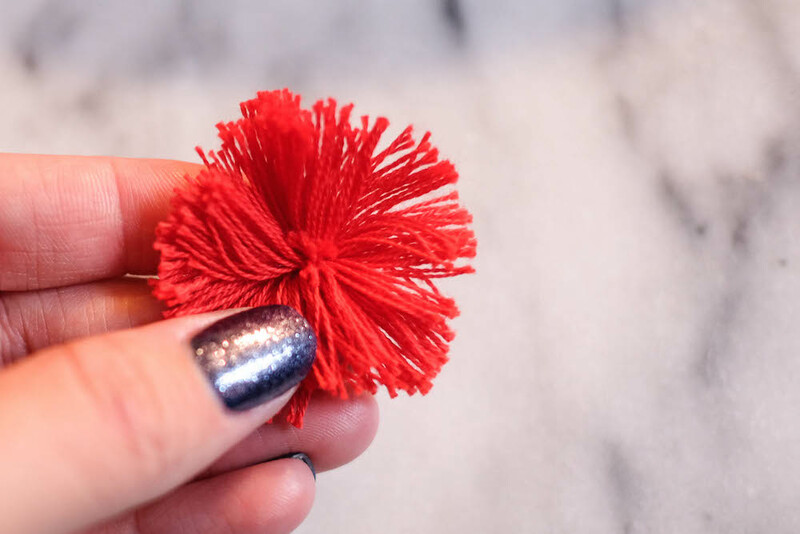 This shop stocks SO many great tassels – you don’t have to buy a set, you can make your own combination… just be sure to use the 1.25″ size. 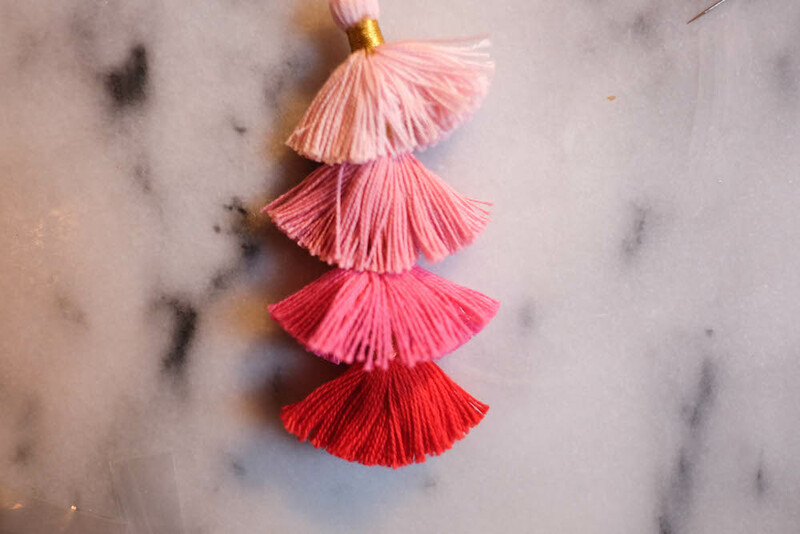 HERE is a link to all of their 1.25″ tassels – pick and choose your favorite combinations!! 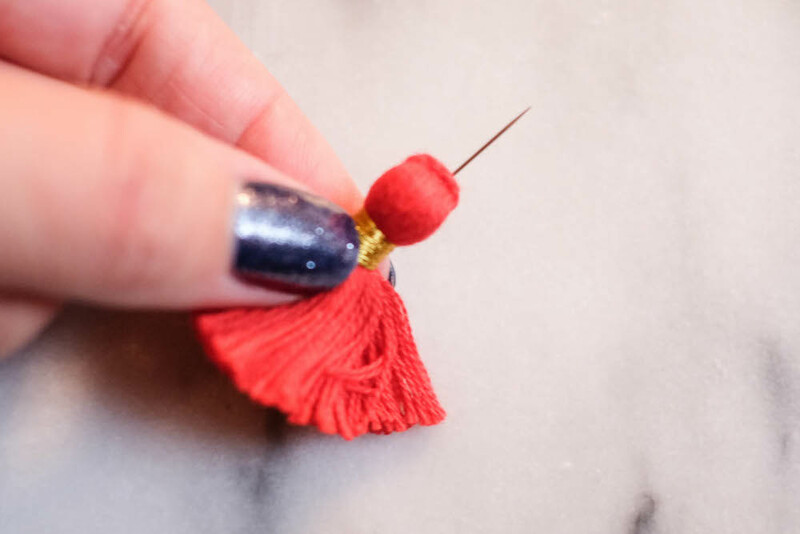 Lay out your tassels in the order that you’d like them to appear. I went with pink ombré in this case. 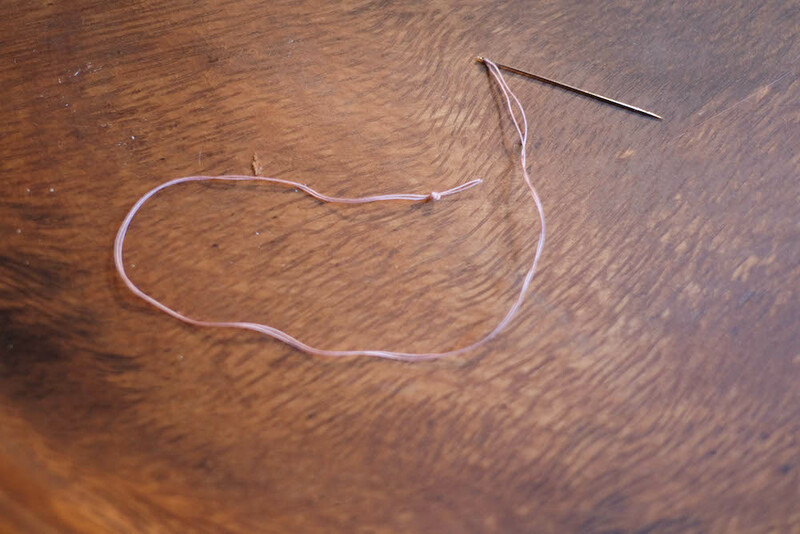 Double thread your needle, quadruple knotting the ends. 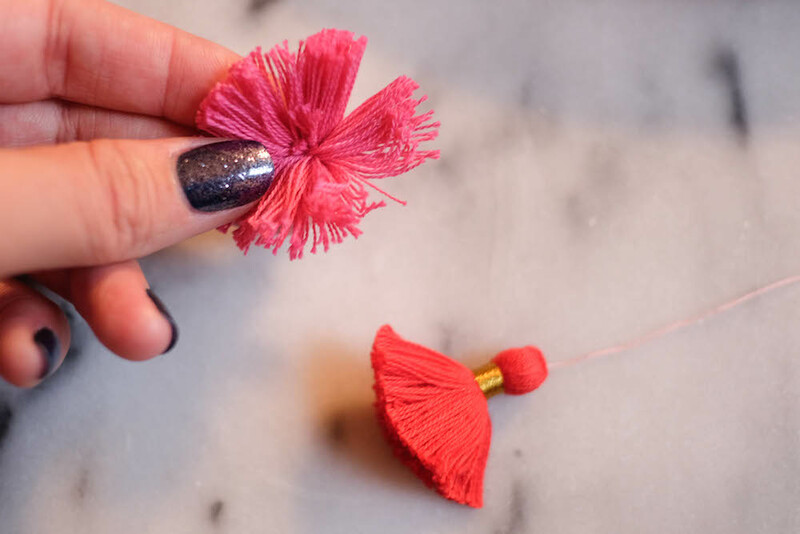 Open up the tassel that you want to put on the bottom. Stab it with the needle, being careful to pierce exactly through the center. This is the hardest part, it took me a few tries. 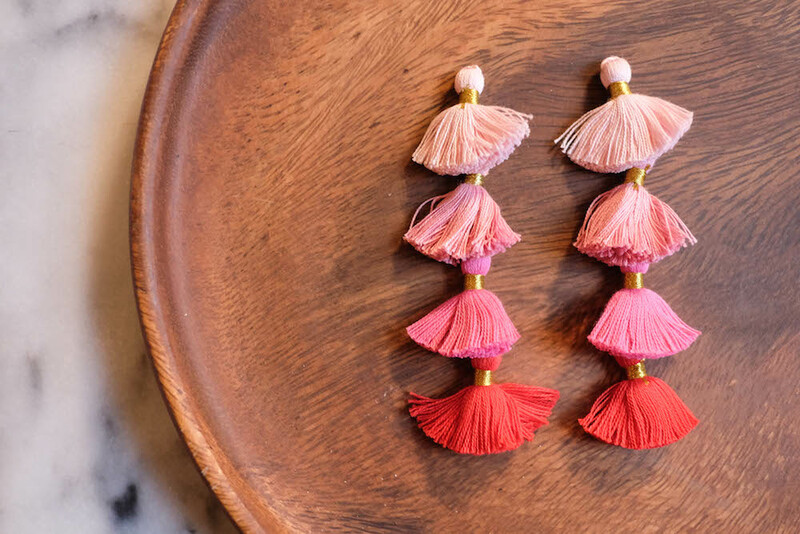 Repeat for the rest of the tassels. 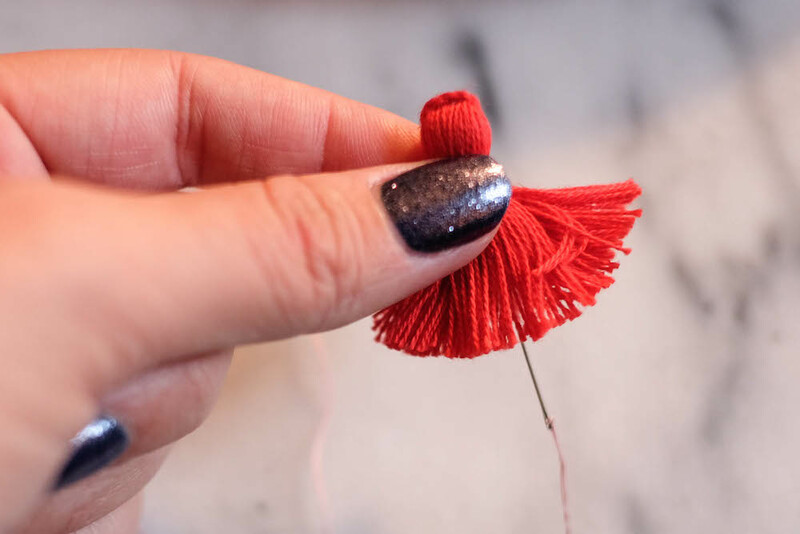 When you get to the end, just tie a knot through the top loop of your top tassel. Fan out the tassels. 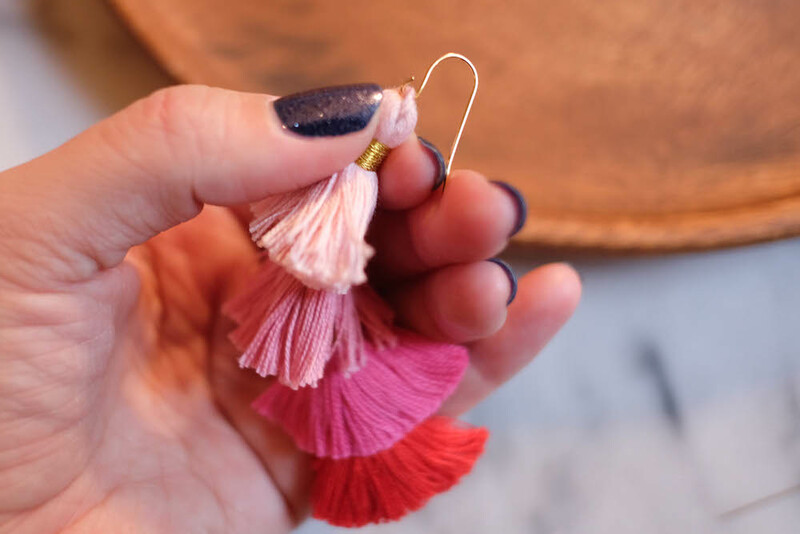 Open up an ear wire and attach through the top of the top tassel. And voila – you are all done! 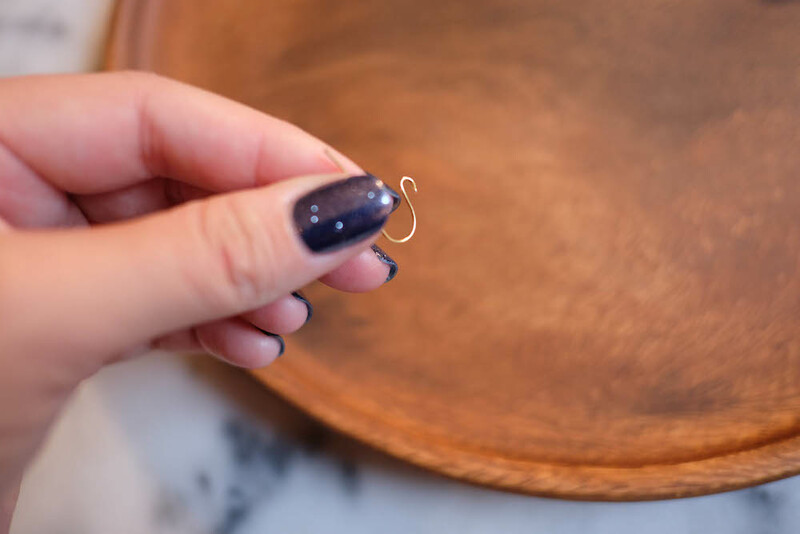 Repeat to make a pair of earrings. Aw thank you!! 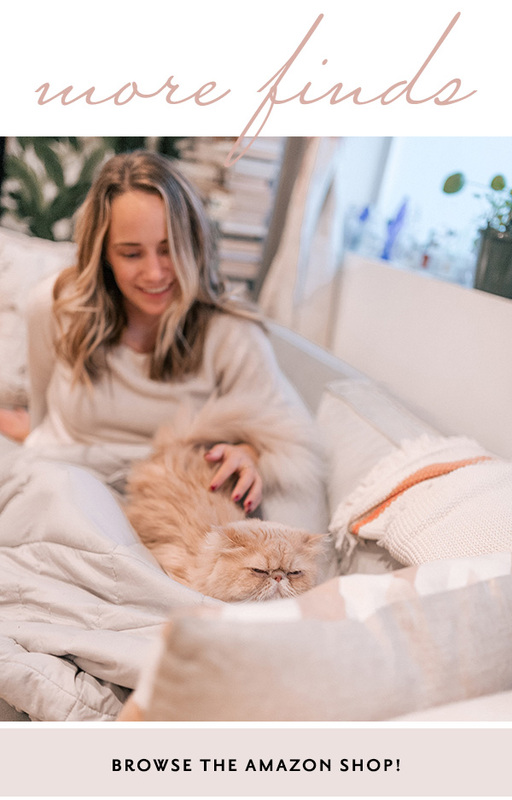 So happy you like the project. 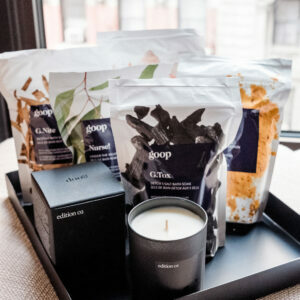 PERFECT to do with of a glass of wine! These are so cute and so easy to make! 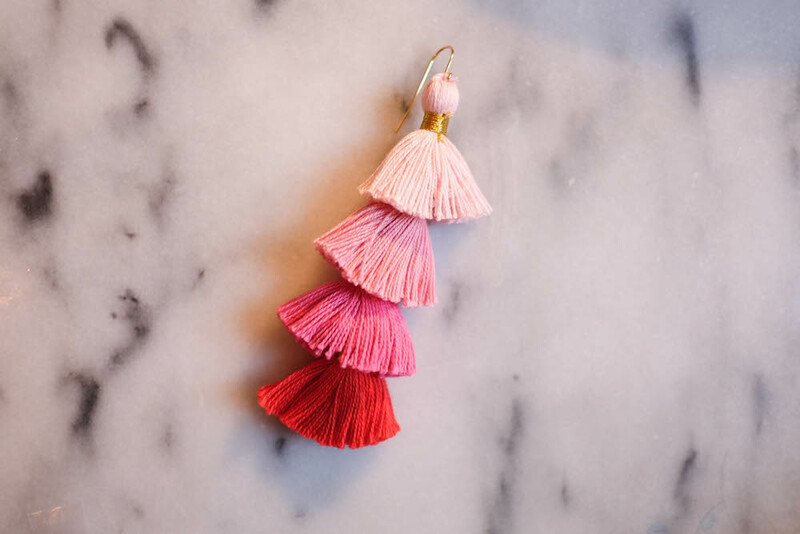 Why haven’t I ever thought of this idea before despite once having an obsession with tassels? What an amazing tutorial!! I’m totally going to try this. 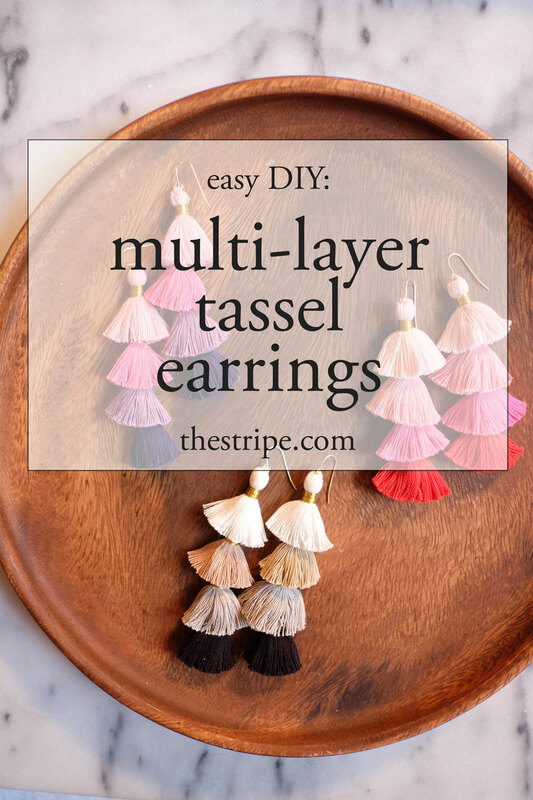 I love those earrings and this is such a chic budget friendly option. Thank you!! You are so welcome! If you make them, please send me a photo! GRACE! this is so cute. do you think i could make a necklace by continuously stringing tassels??? I’m totally making a pair (or two!) thanks! However the links for the sets do not work – can you repost them? love this!! but also having the same problem…can’t get to the links! Try again! I just tried and all the links worked on my side – WEIRD!!! These would make great earrings. yay! hope you give ’em a try!! 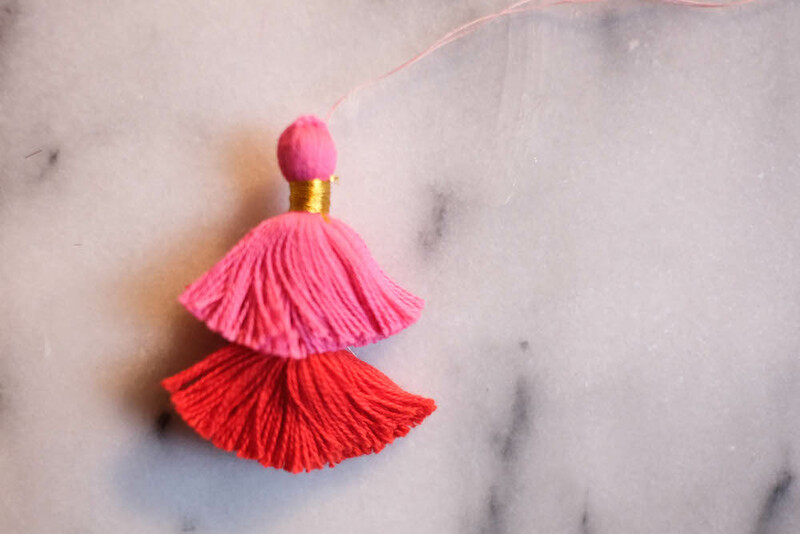 Silly question…but do the tassels all slide down on each other? Is there anything separating them? I LOVE this idea! Love these so much! Such a great idea! Wow, Grace… amazing! And, I actually think I can make these. (heads up the links to the tassel colors you selected aren’t working). What a fun girls night in — with wine! — too. I LOVE this! I’m throwing a bridal shower in a few months and I think I’m going to use this as an activity for that 🙂 Thanks for the idea! I can’t believe how easy this is! 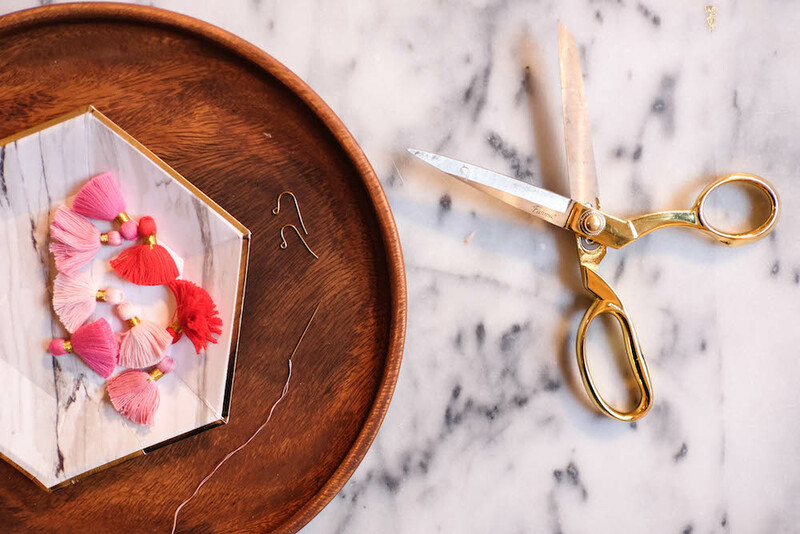 At first I thought you made the tassels by hand, too! Oy! These are lovely, what a great DIY. I’m obsessed! Do you remember the name of the colors or the number you bought for each set? Thanks! Ack – I don’t!!! They have so many sets, I can’t remember which ones I bought. I know the red one was a valentine’s day theme! HI! Could you send me the list of the Neutrals you used in your earrings above! Love the combo. Beautiful! You have inspired me, a weekend project. 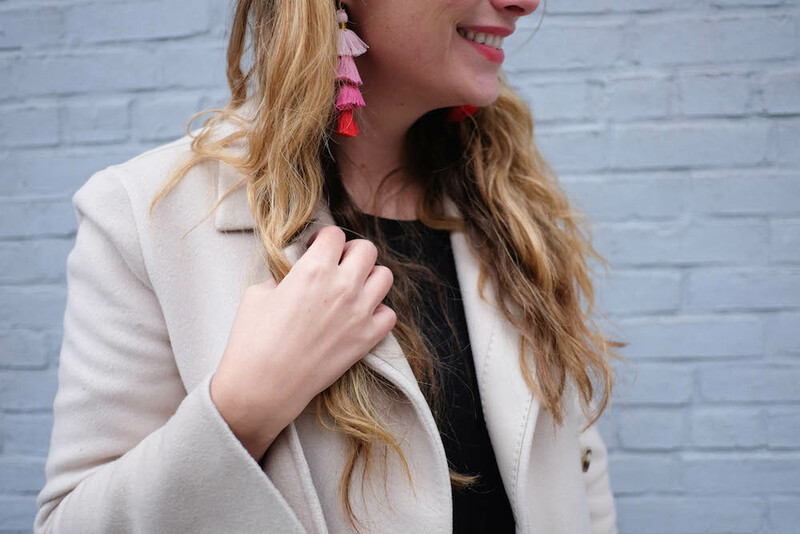 I’ve scoured pinterest for the absolute best DIY for Christmas gifts and I’ve included your fantastic DIY earrings , so fun! tassel at my local Wal-Mart Store in the sewing department? Or…Could you make me a pair of 1/2 white ones? Please respond soon. I’m so sorry but I have no idea! You can probably buy post-backs at your local bead store and won’t have a problem… but I don’t think wal-mart sells tassels. 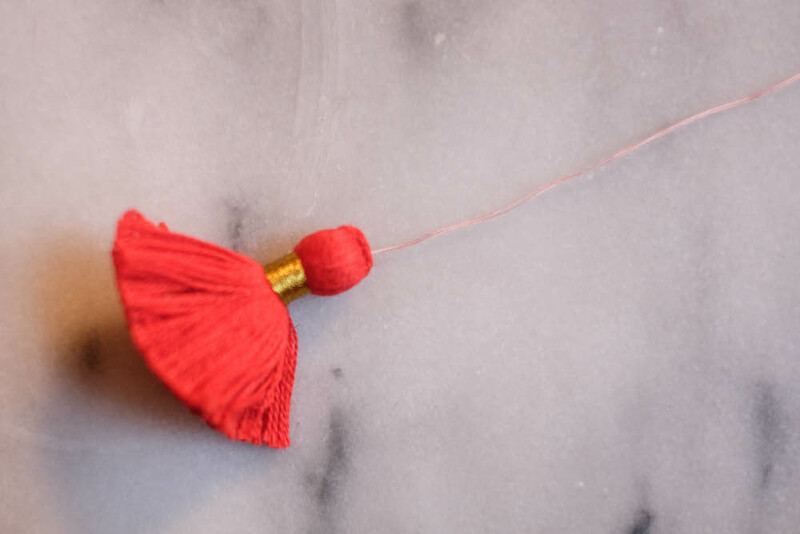 I’d recommend sticking to the tassels I linked to, on Etsy! 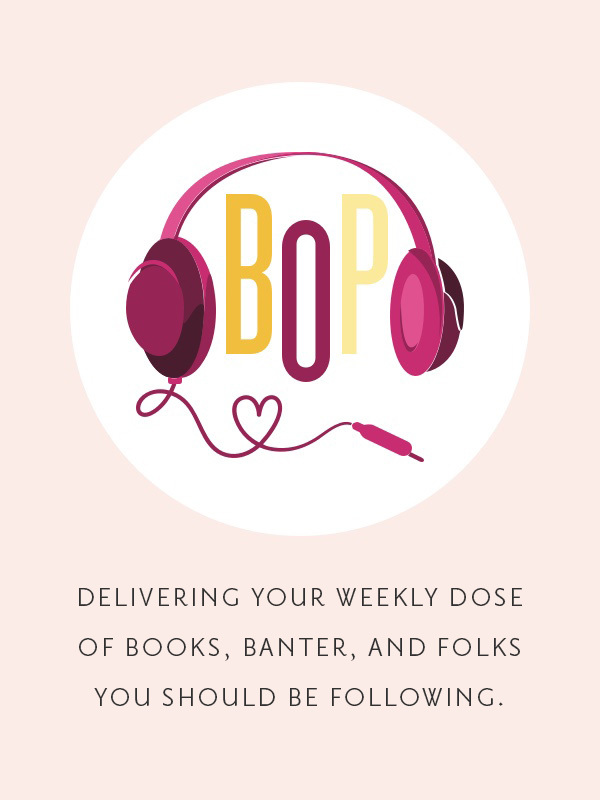 Omg thanks for this blog. This whole time I’ve to buy them so easy to do. Thanks again. 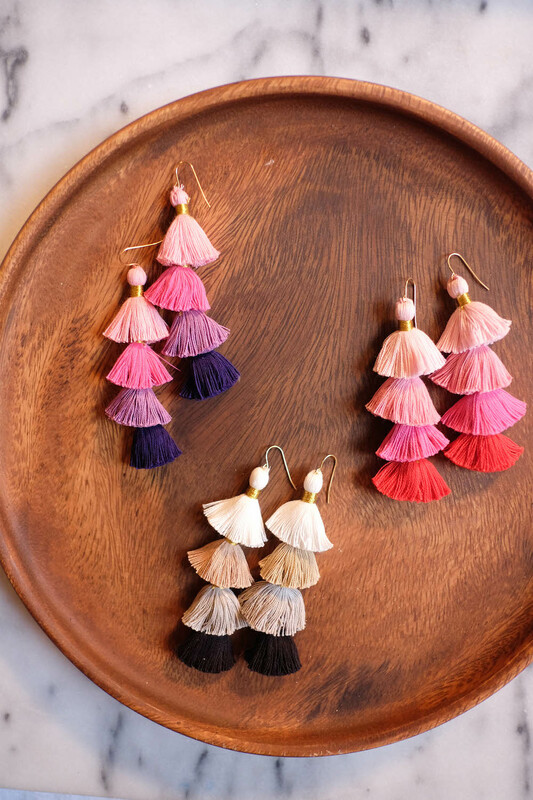 Love these tassel earrings, question, how do you make the tassel for this project? These are so pretty! Thank you for sharing. 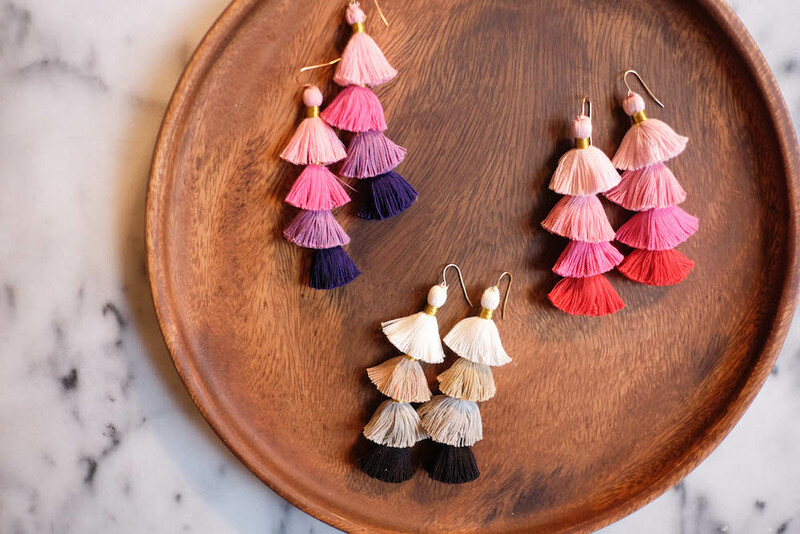 These tassel earrings look pretty awesome and lively. Thanks! It was a fun project to work on!!! Hey,,,Wow, Grace… amazing! And, I actually think I can make these.